Killer Characters: Answer: Macy's, Manicures and Murder. Question: Things You Find at the Mall. Answer: Macy's, Manicures and Murder. Question: Things You Find at the Mall. 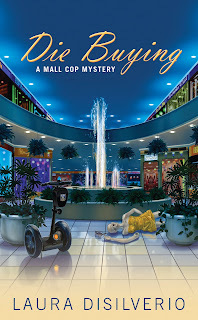 Today Lila Dare and Killer Characters welcomes Emma-Joy "EJ" Ferris from DIE BUYING, the first book in Laura DiSilverio's new Mall Cop series. A former Air Force cop turned mall security officer, EJ has had some adjustment issues. But we'll let her tell you about that . . .
EJ Ferris here. If you'd asked me five years ago where I'd be today, I'd have told you I'd be a first lieutenant or captain by now, and working with the Office of Special Investigations, the Air Force's version of NCIS. I was on the verge of going to Officer Training School when the IED changed all my plans by shredding my knee and lower leg. Now, I'm a mall security officer at the Fernglen Galleria in Vernonville, Virginia, and I suppose I should be grateful for employment of any kind in the current economy, but I must admit I'd rather be a "real" cop. I'm applying to police departments across the state, but I've been turned down by eighteen so far because my leg disqualifies me. This job isn't a lot like patrolling the streets of Kabul. Helping folks find their cars in the parking lot, or discouraging teens from skateboarding on the escalators isn't exactly high-adrenaline work. Even coping with my boss, Captain Woskowicz, a sexist, steroid-abusing dinosaur, doesn't add much edge to my day. My Grandpa Atherton, a retired CIA operative who likes to "keep his hand in" by trying out spy gadgets at the mall, gives me more trouble than shoplifters and vandals combined. That is, until the day someone liberates all the reptiles from the Herpetology Hut (which we affectionally call the Herpes Hut), including a 15-ft python named Agatha. That same day, a woman's scream brings me to a boutique window where someone left a man's dead body displayed like a mannequin. That ups the adrenaline factor, I can tell you. My training kicks in and I start investigating until Detective Anders Helland puts the kibosh on that. He clearly doesn't think a mere "mall cop" knows anything at all about investigating a murder. Well, I set out to show him (and to convince the police department that my having a bum leg doesn't mean I can't detect my way out of a paper bag). On the way, my Grandpa A gets hurt, my roller-derbying best friend Kyra and I have a falling out, and another couple of bodies turn up. Maybe being a mall cop isn't as dreary as I thought . . . Since we're on the topic of malls, what's the strangest or most interesting person or event you've ever seen in a mall? I know what it's like to have a snake on the loose. You have my sympathies. My deep, deep sympathies. Give me murderers any day. I fielded maintenance complaints from mall tenants. One man called and told me he had concrete on his seat. I considered sending the plumber . . .
LOL, this series sounds like a hoot-and-a-half! But I avoid the mall at all costs... crowds of shoppers give me the shivers. Aagh! Just replied to all of you and the blog ate my post. Let me try again. (This is EJ, by the way. Nina--I'll lend you Fubar, my cat, next time you have a loose snake problem. He's a great Hunter. Janet--Being a mall security officer gives me headaches sometimes; I can't imagine fielding maintenance complaints. You have my respect! Victoria--Our adventures are fun. sometimes I'd like to avoid the mall, too, but paychecks are important for things like mortgages, food, beer . . . oh, and Fubar says to add cat food to the list. You never know where a career will take you. I like mine snake-free, but you and your adventures sound like fun. Believe me, Mary Jane, snakes were never part of my career development plan. But, in the military, you learn to roll with the punches, or the snakes, and I think I'm pretty adaptable. I think I need to get out more often! I rarely go to the mall and haven't seen anyone or anything unusual... except for the time the woman was texting, didn't notice the giant fountain ahead of her, and went splat! Lesson? Don't text and walk! I second Nina. Two large female black snakes, for two years, were more than enough. Crafty critters thought they could hide forever, until they got too rapped up w/ a male (who slithered out the door). Transported, w/ assurances to me that they'd never make it back across the bridge. Hope things settle down on your job, but I bet they don't. All the authors around here are murderous. That's so funny, Misa! I'll keep an eye out while patrolling on my Segway for people texting and walking. Liz V: Were your black snakes pets or stowaways? If the former, you're a very tolerant mom/wife! Fubar is enough for me. Stowaways for sure, probably through door open for dogs. My husband could, and did, bring home any stray, including turtles, dove w/ broken wing and chickens escaped from truck on way to processing plant. But very bright line on snakes, which fortunately he dislikes as well.